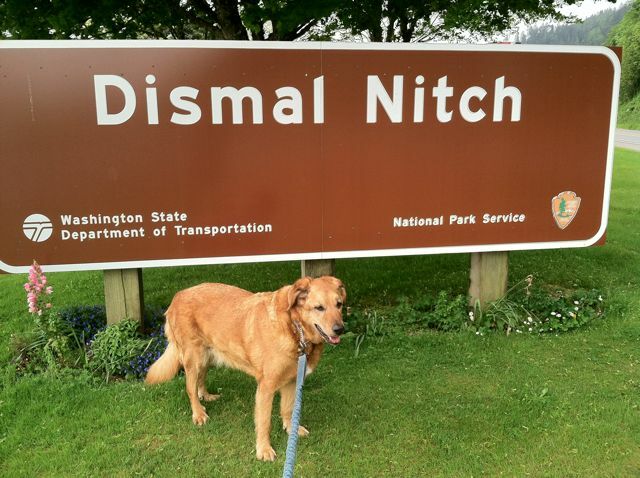 This weekend we packed our overnight bags and Twill and drove up north of Seattle to go to a friend's retirement party and visit with dear friends. We drove up Saturday, visited, and then left early Sunday so that I could spend an hour and a half at the Seattle Art Museum's Exhibit of Rembrandt, Van Dyck, Gainsborough: The Treasures of Kenwood House, London. 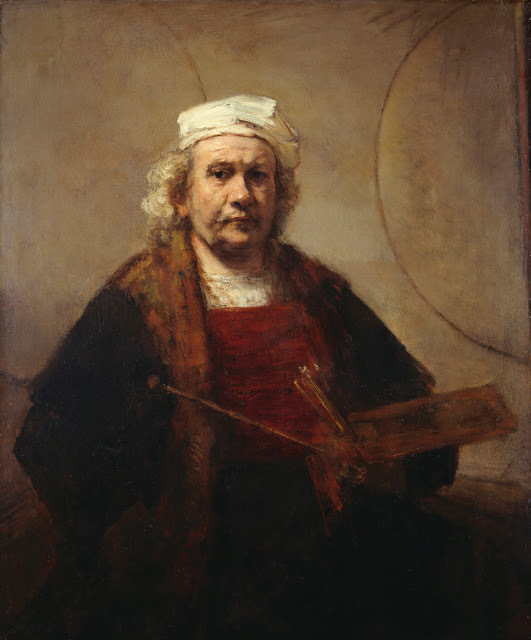 The highlight of the exhibit was the self portrait of Rembrandt in his later years. I bought my ticket online where you had to specify a time slot as well. I chose 10:00 am. My wonderful mate agreed to drop me off in front of the museum and take Twill to a park while I saw the exhibit! 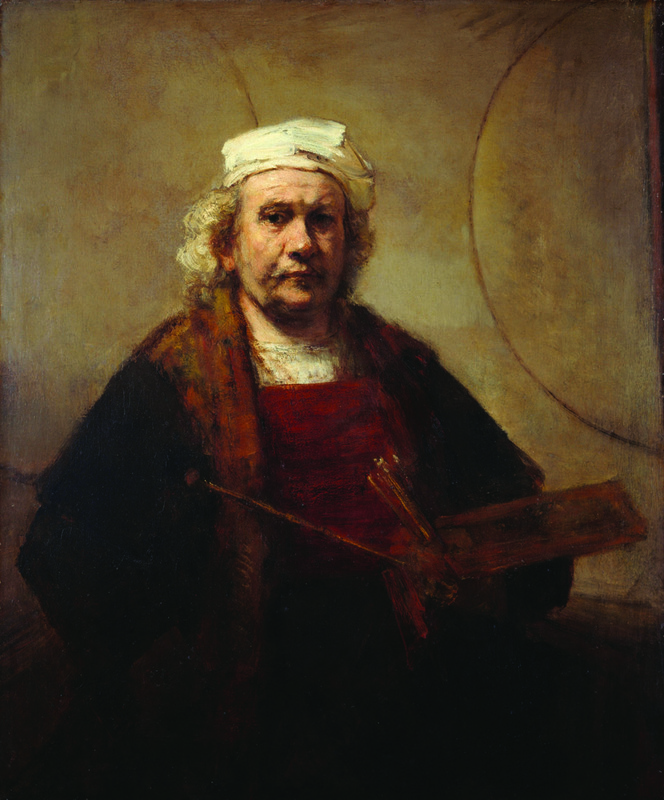 Self-Portrait with Two Circles, Rembrandt 1665-9, oil on canvas 45"x37". Photo courtesy of the Seattle Art Museum. 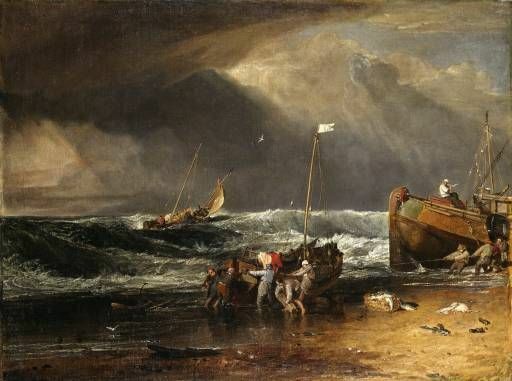 A Coast Scene with Fishermen Hauling a Boat Ashore, J.M.W. Turner 1803-4, oil on canvas, 36"x48"
Of course I studied this one a bit too. 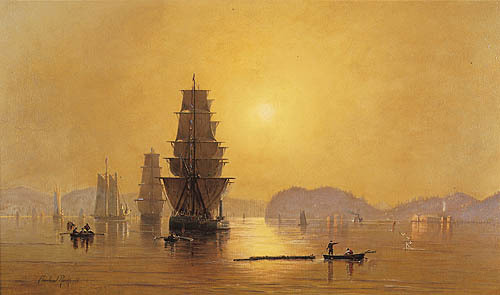 I have to admit, I am not a huge admire of Turner. That is not to say that I think his work is bad, it just doesn't appeal to me as much as others do. I will reserve my judgement on whether or not waves do what they are doing in the painting until I get myself to England and see for myself. I did learn a bit as always from studying it. I would have liked a bit more time. I am also not a fan of Gainsbourough and a few the other English painters that were included. All of them were worth looking at and studying though. It is always interesting to see how other artists approach paintings, specially the old masters. One of the many things I noted while looking at the Exhibit was that many of the paintings on canvas were cracked or crazed. There was also a few paintings on wood panels and they were smooth and vibrant looking. I have been painting on linen canvas lately with the larger painting I am working on and this weekend pretty much put the final twist on a decision to paint mostly on panels. I like the smoothness and the vibrancy the one can get. 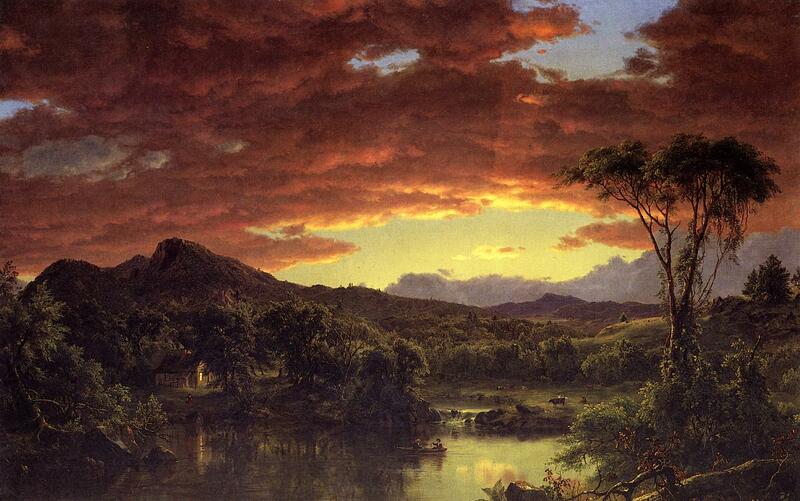 Horseshoe Falls, Frederic E. Church, 1857, oil on paper mounted on canvas, 11 1/2"x35 5/8"
I love Frederic Church's paintings and have mentioned them in past posts. What a treat to see them in person. I would love to see them again. The two above are paintings of the area in which I live. The top painting by Cleveland Rockwell is exquisite and is another piece I could spend more time in front of. The bottom painting is stupendous! It is larger than I am and quite dramatic. 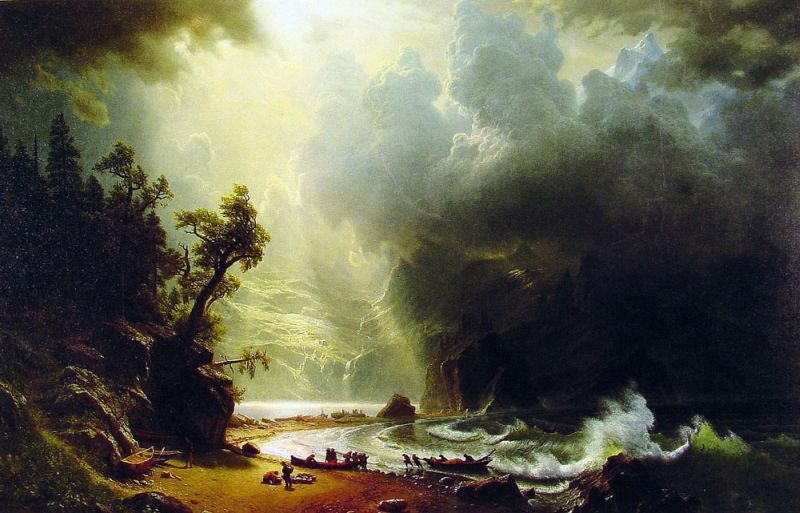 I studied the waves, the lighting, the brushwork, the detail. I really didn't have enough time and the next time I am going through Seattle I will spend time at the permanent collection gallery where these hang. Hmm, reading back through this post it is apparent the small amount of time I had was not enough! I am not saying I want my paintings to look like these but I do want them to have the same effect on people that these had on me. I was grateful I got to take a little time out of a very busy weekend to see this exhibit and paintings. What a treat! Of course I would like to go back and look again at the last few paintings. We got back late Sunday afternoon and grabbed a quick bite of dinner before heading to band practice. I am feeling a bit hammered today from lack of sleep and too much visiting with people. It takes a lot out of this introvert to spend that much time interacting with people, even friends (the dear friends who put us up for the night are an exception!) I spent the day catching up and tomorrow am keeping my fingers crossed that I can get out and paint. I NEED it! That is my report on my little field trip to the museum. Will be posting paintings next time! Dismal Nitch and yes, it was living up to its name, cold and very windy!